Video Conferences like Skype are a fantastic new chance of international artistic collaboration – but they require the competence to handle them. By Michael Sommer, artistic director of the German PHONE HOME team. The thrill, the challenge, the joy of unchartered territory! When we first set out to plan PHONE HOME, none of the people involved had ever done anything like it before. Our idea was to connect three theatres in London, Munich and Athens via Skype to set a truly international stage for stories about a truly international topic: How do we communicate about refugees and migration, how do we maintain the connection between home and abroad? Our plan was straightforward: During a research phase including workshops with refugees, we explore our topic individually in the three countries, then we get together in real life and workshop the material with actors. This first meeting of the PHONE HOME teams took place in April 2016 at Pathos Munich. We had planned to experiment with three interconnected rooms (conveniently located next to each other, not thousands of miles apart) and of course to get to know each other in person. Although we had planned the event in detail, it turned out to be different from what we expected. The most surprising experience was: We, the artistic directors, the dramaturgs, needed time to talk face to face, before giving tasks to our actors. I say surprising, because obviously we had been talking, that is Skyping, literally for years. Still, not all our expectations had been exchanged during our Skype calls, we needed time to settle them, to talk everything trough. I think the reason for this is that using Skype conversations in order to be artistically creative together, one needs a different kind of discipline than in face to face communication – a competence that has to be learned. 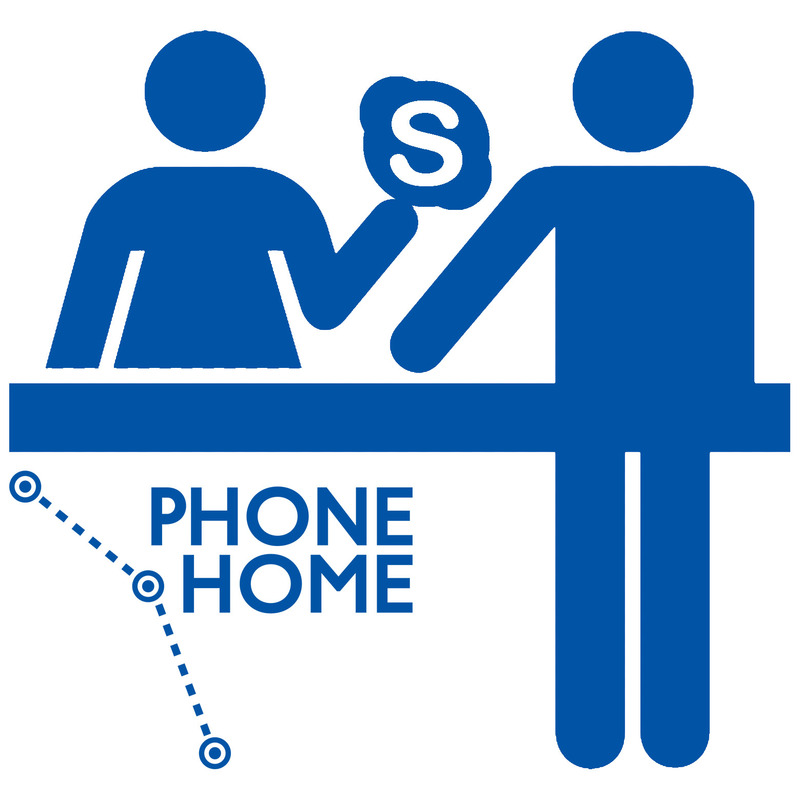 I have stressed in an earlier blog post that Skyping has great advantages compared to phone calls in that it includes facial expression and gestures into communication. But although it opens a window to the conversation partner, it is still only a cutout of the world she or he lives in, and: we behave differently online than we do in real life. Let me compare this to code switching: When we are with our family, we often speak with a different accent than in business life, e.g. When we talk online, we sort of perform for the screen, at least if we’re not familiar with the person on the other end. To return to our workshop: At the end of the week, we had reached many of the goals we had set ourselves, we had formed one team out of the three teams, we had identified stories that we wanted to work on, we had tried out the feel and the technology of performing in different rooms connected by Skype. We had not achieved all that we wanted, but we had gained one very valuable insight: It is perfectly easy to have a chat via Skype, to exchange information or manage business; but in order to really get creative in a team online, you need practice, you need to be familiar with the technology and with your partners. I am grateful for this aspect of our workshop experience and find that communication between all of us has improved. And although the dramaturgy team have met again in person since then, and although most of us will meet in person in Athens next week in order to kick off our rehearsals, I think we’re also really going digitally native step by step.